Last night I did something I’d always wanted to do, but had never gotten the chance: I went out to the middle of nowhere (sort of) and watched the Perseid meteor shower. I say sort of because the spot I went wasn’t exactly top secret and quite a few people turned out to see the show. Still, it was far enough from the city lights to make for a good viewing experience. The difference between me and probably everyone else there? I was alone, and I couldn’t have been happier. I’m an only child, so I’ve always been fairly content in my own company. I think that’s part of what makes me suited to writing–spending chunks of time in self-imposed solitary confinement doesn’t usually tend to bother me. Sometimes I actually find it comforting, as I did last night: laying on the hood of my truck, staring up at the stars and watching meteors punctuate the sky like something out of a dream. Still, there are times when loneliness creeps in. I should explain. A couple of months ago I began living alone for the first time in my life, and even though I said that about being okay with being alone, it’s taking some adjustment to get used to. Since I work so much overtime at my day job I really don’t have a lot of free time, and I generally do pretty good at making the most of it when I do, but sometimes, now that I’m alone anytime I’m not at work…yeah, I get a little lonely, mostly on my days off. When I do get bitten by that little bug called loneliness, I try to find something to do that will occupy my time, however mundane it may be. Last night I found myself getting restless and bored and yes, a little lonely, while I killed time until it was late enough to go out and watch the meteor shower. During those intervening hours I wrote an email, played the guitar for the first time in ages, even found myself scouring a rusted cast iron pan in dire need of some TLC. It worked, as eventually the time came for me to drive out to the small local observatory where people went to watch the shower. The observatory had special late hours, so I went in and had a look around and took a gander through their giant telescope (a bit disappointing…shhhh, don’t tell them–I don’t want their feelings to be hurt), and took in the variety of people who had turned out for the show. The bros there with their stereo, a cooler of beer, and some girls, who got more than a little intoxicated by the time they left. The young couple who perhaps thought, as did I, that the spot may be more desolate, providing them a good make-out spot. The family who parked behind me, with their boy of about 10 who was clearly fascinated with astronomy, and in his excitement had apparently lost the ability to control the volume of his voice. Everyone within a 100 foot radius knew that he knew where the Milky Way was, not to mention a few constellations, and, in one bizarre tangent, the history of the twin towers and the events of 9/11. Slowly, one by one they left, until I was practically alone with the insects and the few remaining die hards who I assume were staying out until dawn. That’s when it got peaceful, almost zen-like. It was quite nice. Last week I spent a day off doing whatever I wanted, for the most part–a day just for me. I drove around the city (which is not just something I find enjoyable but also helps me with my job as I continually get more familiar with the city’s geography), went to a used bookstore and picked up a couple books, and treated myself to a movie (The Gift if you’re interested, which put an excellent spin on the “crazy stalker” type thriller–highly recommend). Just me and my box of Hot Tamales, and I had a great time, and a great day. Not once did I feel like I needed anyone else to enjoy it more. So while I still have the occasional bout of loneliness (like the one I’m currently battling by writing this post), I’m getting good at spending quality time with the guy in the mirror. And that’s good, because he seems like an alright guy–I think I like him. 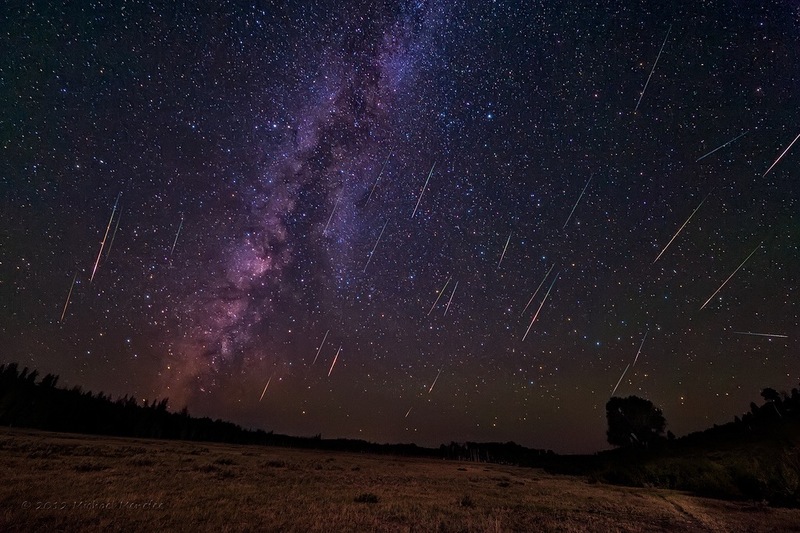 This entry was posted in Other and tagged being alone, loneliness, perseid, solitude. Bookmark the permalink. I think I like that guy, too…Seriously, great to hear you’re back. Looking forward to more, whenever the time comes to post again. Thanks, brother! It’s good to be back– I didn’t realize how much I missed it until I started posting again. The bad thing about using WordPress(for me) is that when I’m not posting I’m also not reading other people’s posts. I have some catching up to do.